Nordstrom, multiple locations; Bowtie and pocket square: The Tie Bar; Boutonnière: Hidden Garden, Los Angeles. “My overall inspiration was a blend of my wife’s classic style with my desire for an original look,” explains Will Wysong of his attire at the Trump National Golf Course in Rancho Palos Verdes. Sporting a James Bond-inspired lapel on his classic Hart Schaffner Marx black tux, Wysong added a matching paisley bowtie and pocket square in order to a channel a timeless style with a twist. Tuxedo and shirt: Nordstrom, multiple locations; Bowtie and pocket square: The Tie Bar; Boutonnière: Hidden Garden, Los Angeles. For Ashan Senaratne and Sam Leslie’s regal Gatsby affair designed by Los Angeles-based Natalie Sofer at the Hollywood Roosevelt Hotel, the duo turned to one of their closest friends, famed costume designer and former Halston designer John David Ridge (Pleasantville, Spider-Man and a slew of Broadway accolades) for custom-designed attire. Ridge hand-crafted the duos matching gold bowties and Italian silk vests (accented with vintage Chanel gold buttons) as wells as Senaratne’s Jay Gatsby-approved white suit and Leslie’s 1920s style Italian silk suit. 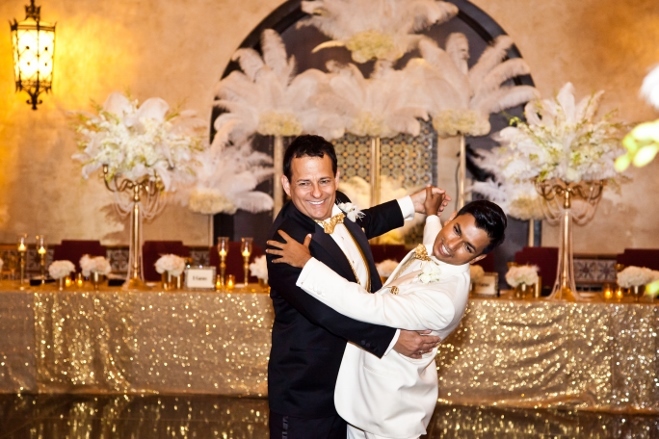 Feathered boutonnieres capped off their custom-designed old Hollywood-inspired looks. 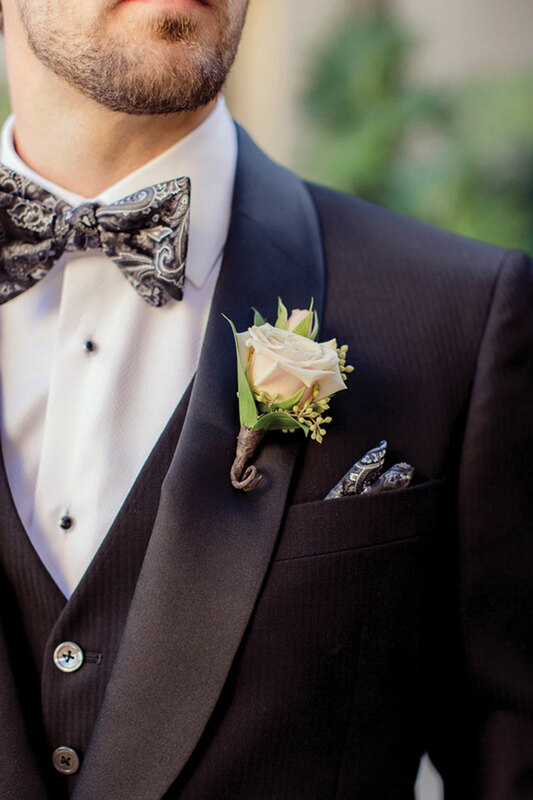 Tuxedo and vests: John David Ridge, Los Angeles; Shirt: Anto of Beverly Hills; Boutonnière: Butterfly Florals, West Hollywood. 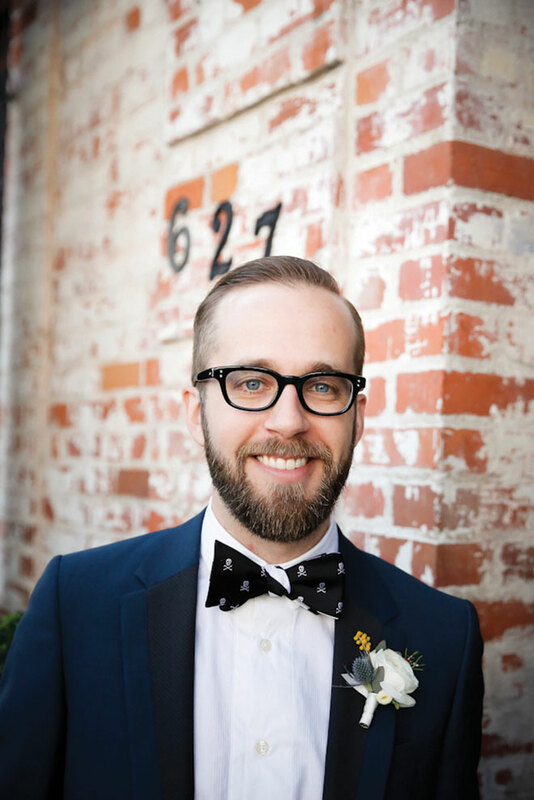 For his Riveria Palm Springs wedding, Matt Dorsey added a preppy touch to his classic black suit with a pink-and-blue plaid bowtie and matching suspenders atop a pale pink shirt. His look is finished with a boutonnière consisting of a single coral tea rose, succulent with lily grass and a turquoise jewel accent. Suit: Macy’s Men’s Store, Multiple locations; Bowtie: The Belle and the Beau Etsy shop; Boutonnière: Artisan Event Floral Decor, Palm Springs. 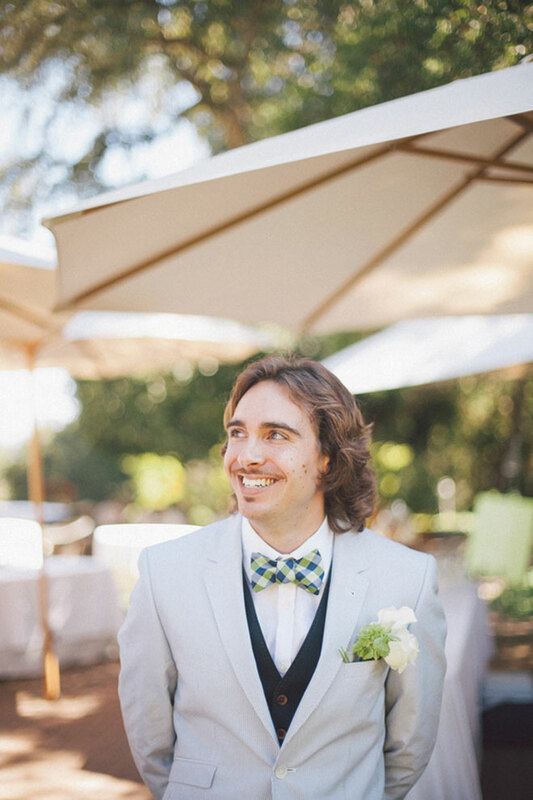 For Scott Drapeau and Japanese-born Nagisa Mochizuki’s wedding at Sonoma Valley’s Madrona Manor, the couple wanted to blend of both of their cultures by beginning in Western wear and transitioning to traditional Japanese attire. For his western attire, Drapeau wanted a look with a classic British sensibility and modern styling. 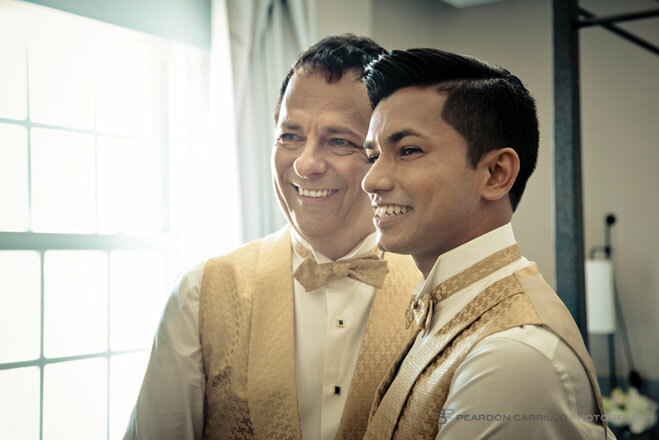 When Nagisa suggested a pinstripe-like seersucker, Scott found the answer in a dapper Ted Baker suit adorned with a boutonniere handmade by the bride’s mother. Drapeau and his bride then changed into traditional kimonos, brought by the bride’s family from Japan. Suit and accessories: Ted Baker, Multiple locations. “I would be lying if I said my suit was not inspired by Ryan’s blue Ferragamo tux,” says James Thayer, referring to Gosling’s suit at the 64th Annual Cannes Film Festival. For his wedding at Los Angeles’ Cardondelet House, Thayer paired a deep blue Paul Smith tux with a skull and crossbones bowtie, originally meant for the groomsmen.“I spent so much time the morning of the wedding learning how to tie one that I decided to roll with it.” Paired with a simple rose boutonnière, the look is the perfect blend of hipster and elegance. 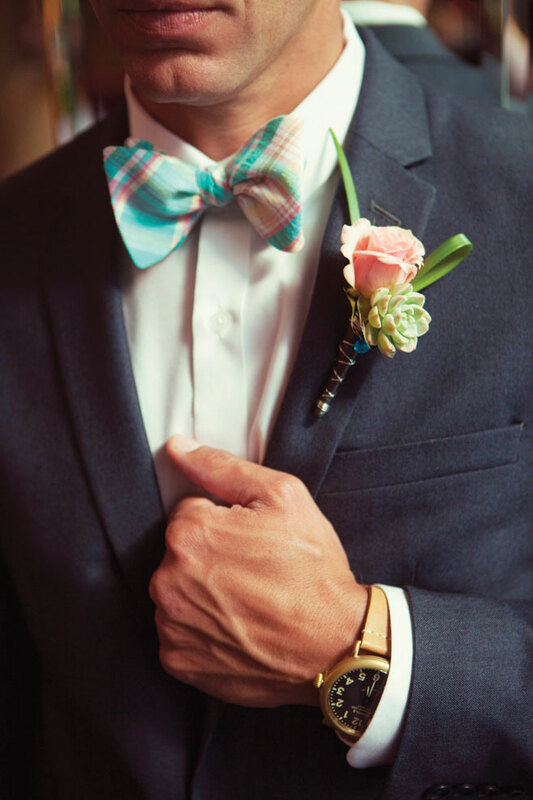 Suit: Paul Smith, Multiple locations, Bowtie: Thrillet’s JackThreads; Boutonnière: Eucca Floral Studio, Dana Point.